Toasted rolled oats and delicious chocolate chips. These granola bars are chewy goodness and contain the nutrients of one full serving of vegetables. Feel good about choosing Chocolate Chip. Dark chocolate is not only delicious; it’ll satisfy your sweet tooth while delivering beneficial antioxidants. Hooray! All MadeGood ingredients are ethically sourced. 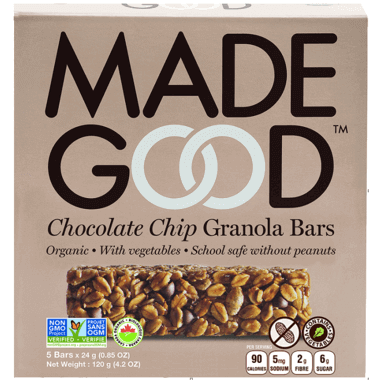 All products from Made Good are quite tasty and have no Soy (GMO or non-GMO), so I can have this without becoming ill. Thank you, Mad Good! Perfect for when you want a little sweetness without too many calories! Good, but sweet compared to other bars. Love this bar - fills my chocolate craving and is a healthier alternative to many other bars. Who would have thought something healthy could be this good? The chocolate chips taste amazing and the whole granola bar in general is so good! Love that thereâ€™s a serving of vegetables in it! Really great - I love the chocolate chip flavor but I've tried the berry as well. They are a perfect snack and if you are tracking weight watchers points or calories, they're a great solution and much less than a typical granola bar. Highly recommend. This is our family's go-to granola bar. They're not too filling and for my youngest, anything with chocolate will be eaten. Bonus - the hidden vegetable serving in each bar. Not only are these bars healthy they taste amazing!! Such an excellent option for our family which has family members who have to follow a gluten free and peanut free diet. Really great snack. My favorite madegood product. Tasted good and much healthier than a grocery store chocolate bar. Love that these bars have a serving of veggies. They taste good and the kids love them. They are small but great size for kids. Love these! Safe for my dairy-allergy kiddos, school safe and healthy. My kids beg for them! These are SO good! I have allergies to nuts, and these are one of the only granola bars that I really like. I've given them as gifts too. Bonus: there are veggies hiding in there. My kids like these. They're the only granola bars I feed them now. They taste great and are perfect to take as a quick snack. I like how my little one doesn't know that there are hidden veggies in it. Best kid snack when you're in a pinch. No nuts and it tastes great. I love it too. My 3 year old loves these bars! They are healthy and delicious and great to throw in a bag for traveling. Perfect size for little kids' hands. We love them! Only discovered these recently and have since become addicted. A great snack and serving of vegies to boot! Just the right firmness and just a touch of chocolate, taste good and I can feel good eating them. I was not sure about the agave ingredient but so far it has not caused issues (I'm sensitive to way to many things, and these have been a great solution and filled a big snack gap). These bars are great - I'm a nursing mother and like to keep snacks on me at all times. These are small but filling and taste great. Our kids favourite! We like them too - not too big, 'healthier' and nut free which means we can send them to daycare for a snack. This one is my favorite, just wish they were a bit larger. This product is excellent. I try to watch my weight and cholesterol and this sweet tweet really fills the bill. As well, it is nut free and children can take them to school! Very tasty, chewy and chocolaty. My 3 year old loves them. I do find them quite sweet for my taste though. I think if they were a bit less sweet they would be just right. I was looking for a healthier, gluten-free granola bar and thought this would be my answer; however, I found them to be overly sweet. The taste is nice, but I can't see buying them again due to the sweetness. Very good bars. Kids likes them. Lacking a bit of proteins but the price is very competitive for this quality. I am a regular buyer. I have been buying these for my daughters lunch for 3 years. Delicious, school safe and full of nutrients. Love that well.ca carries them at a competitive price. Highly recommend these and the other flavours too. The only granola bar I can find without processed sugar. Buy these for my daughter's lunch box on the regular. My favorite granola bar. Reasonable price too. 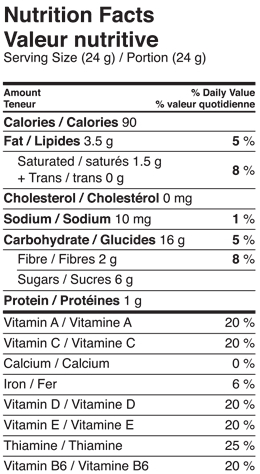 These are my favourite granola bars and favourite flavour. It's like eating a cookie - satisfying without the extra sugar and cals. Recommend! These taste great and I am happy with the ingredients. I just wish the serving size was a bit bigger. Great taste (kind of tastes like an eat more bar lol) I love how good they are for you too. Love them, sugar is low, and veggies are high. Delicious and less sugar than most national Brands. For a packaged granola bar these are pretty healthy. Also, my kids love them! These are a great snack. The bars are quite small and have few calories. I liked the taste, but I did find them to be a bit chalky. I would purchase again. Great snack bar without high sugar content. Excellent product! They are soft and tasty, perfect size for snacking. Organic and healthy - GREAT! This flavour (and the strawberry) are the BEST! Yummy and healthy, but a bit pricey to stock all the time. The idea of these is good..... but the taste doesn't do it for me. They are hard and have a weird taste. The bars are also so small!! Would I buy again? No. Not a fan of these, I find them tough and dry and not very flavourful. Two stars for being vegan which is a plus. These are my favourite snacks to send with my kids to school. Great product. Tasty, few calories, and with a serving of actual vegetables -- what's not not like?